President Juncker said that Sibiu is the moment where "we must offer all Europeans a strong perspective for the future". Triggered by Brexit, the EU began a process of reflection, soul-searching and possibly reform – the so-called "Bratislava process" or the "process on the Future of Europe". EU institutions, Member States and civil society have made a number of contributions to this process. 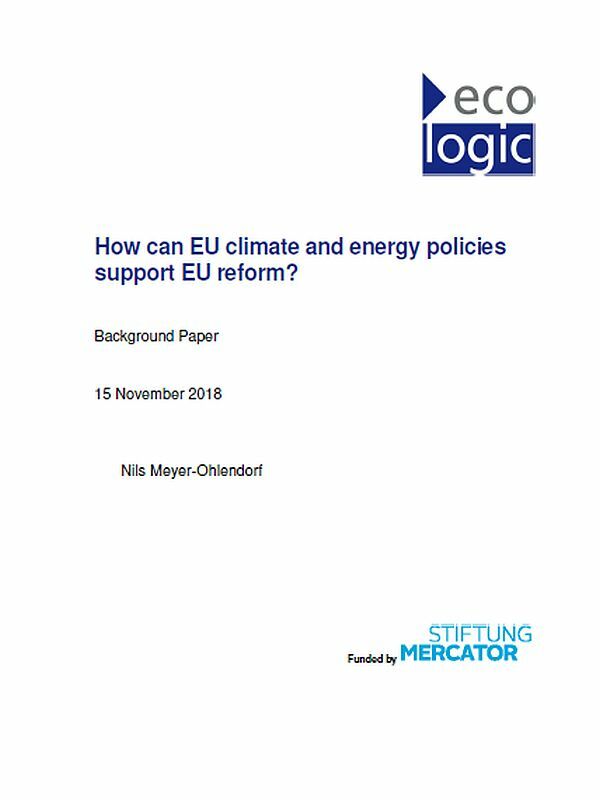 This paper of the Ecologic Institute discusses how EU climate and energy policies can support the EU reform process. Meyer-Ohlendorf, Nils (2018). How can EU climate and energy policies support EU reform?, Ecologic Institute, Berlin. 4 Migration is a difficult starting point for EU reform: Can climate and energy policies help? 6 Can EU climate and energy policies help formulate a (re)newed vision for the EU? 7 Can climate and energy policies help strengthen EU foreign policy? 8 Can climate and energy policies serve as a role model for a more transparent EU? 9 Can climate and energy policies serve as a role model for a more participatory EU?